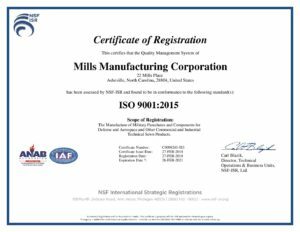 At Mills Manufacturing Corporation, quality is an integral part of our mission and core business values. These guide our actions to ensure that we deliver the highest quality products to satisfy our customers’ requirements. Our quality policy consists of our Mission, Values and Commitment to Continual Improvement. Building products that bring our troops safely to the ground 100% of the time. We constantly strive to build trusted, sustainable relationships with our people, customers, and suppliers because these are all vital to our long-term success. We believe in collaboration with strong teams for delivering the right results. We will continually drive accountable authority through all levels of the organization in order to achieve our business goals. We will ultimately achieve our financial results and build loyal customers with superior execution in every aspect of our business. As a locally owned employer, Mills is committed to giving back to the community. Mills Manufacturing Corporation is committed to being the world’s most trusted leading manufacturer of military parachutes by investing in our people and processes in order to best deliver a balance of quality, reliability, and price that meets the needs of our customers. We focus on strategic planning to ensure that the Quality Management System is fully maintained and quality objectives are established throughout the organization for those processes affecting the products being manufactured. These objectives are measurable and consistent with our goals of continually improving the quality of our products. We invest in our employees’ development to promote and encourage employee participation and engagement throughout the organization. This is an essential element to maintaining our high quality standards. We continuously strive to improve our processes through lean manufacturing principles. We invest in machine automation where possible to reduce variation, defects, and waste. We focus on building a strong and sustainable relationship with suppliers to ensure our products are manufactured with the highest quality materials. We ensure our infrastructure and equipment are well maintained, which provides a safe, non-discriminatory workplace that promotes and encourages participation and engagement throughout the organization.